The 24-episode drama "Sikgaek" is enjoying popularity, stimulating the appetite of TV audience around the country. Based on Hur Young-man's popular comic series of the same name, the film version of the series, titled "Le Grand Chef," was also a huge hit when it was released last year. In the drama, a culinary genius dreams of becoming the best chef in the country. Korean Wave star Kim Rae-won plays the leading role, Sung-chan, and Kwon Oh-jung plays his rival, Bong-ju. A beautiful restaurant manager and a food magazine journalist, played by actress Kim So-yun and Nam Sang-mi, form a love triangle, raising the tension. 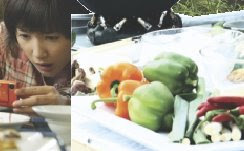 While the film version focused more on the fierce cooking competitions between two main characters, the drama looks for the essence of Korean cuisine, showing Sung-chan scouring the countryside to find the best cooking ingredients. Keen media interest in and out of the country is also being paid to the drama. Unlike the TV show "Daejanggum," where a female chef cooks for the royal family during the Joseon Dynasty, “Sikgaek” shows more common Korean cuisine consumed in daily lives. Recent episodes featured hanwoo, or Korean beef, competitions, introducing how high-quality Korean cows are raised, slaughtered and cooked. "The reason why good hanwoo is more expensive than imported beef is explained in our drama. Because the producing process is seen in detail, I hope the drama to be helpful for hanwoo consumption," Kim Rae-won told reporters during a news conference. Nam Sang-mi, who plays a feisty journalist in the drama, added, "The whole experience, traveling around Korea, feels like a photo album." Aired by local broadcaster SBS, the drama continues until the end of August. This is one I realy hope to check out.